New Rochelle, NY, April 4, 2019–Researchers have proposed new guidelines to overcome current problems facing scientists developing synthetic nucleic acids – such as antisense oligonucleotides and double-stranded RNAs – as drugs and research tools. The guidelines, which promote a common set of standards for judging experiments and more efficient use of resources, are published in Nucleic Acid Therapeutics, a peer-reviewed journal from Mary Ann Liebert, Inc. publishers. Click here to read the full-text, open access article for free on the Nucleic Acid Therapeutics website. In the article entitled “Guidelines for Experiments Using Antisense Oligonucleotides and Double-Stranded RNAs” coauthors Keith Gagnon, School of Medicine, Southern Illinois University (Carbondale) and David Corey, UT Southwestern Medical Center at Dallas, TX state that current experimental designs are too often inadequate, leading to misleading interpretation of data and findings that are unsupportable and a waste of resources. The authors provide practical advice for performing experiments with synthetic nucleic acids, including long noncoding RNAs (lncRNAs) and microRNAs (miRNAs) and present minimum standards for published research. They focus on topics including experimental design, measuring gene expression, measuring cell uptake, selecting controls for cell culture experiments and animal studies, and special cases. “The issue of proper controls for oligonucleotide studies has been extensively discussed by the board of the Oligonucleotide Therapeutic Society. This thoughtful set of guidelines has now been endorsed by both the board of the Oligonucleotide Therapeutic Society and the editorial board of Nucleic Acid Therapeutics. This paper reinforces our continuing commitment to improving experimental design and we encourage submission of further commentaries that share this goal,” says Executive Editor Graham C. Parker, PhD, The Carman and Ann Adams Department of Pediatrics, Wayne State University School of Medicine, Children’s Hospital of Michigan, Detroit, MI. Research reported in this publication was supported by the National Institutes of Health under Award NumberR35GM118103. The content is solely the responsibility of the authors and does not necessarily represent the official views of the National Institutes of Health. 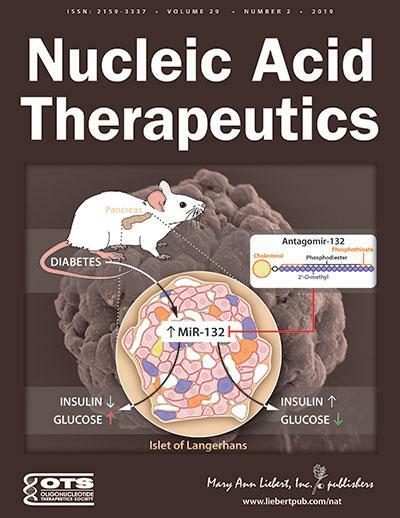 Nucleic Acid Therapeutics is an authoritative peer-reviewed journal published bimonthly in print and online that focuses on cutting-edge basic research, therapeutic applications, and drug development using nucleic acids or related compounds to alter gene expression. The Journal is under the editorial leadership of Co-Editors-in-Chief Bruce A. Sullenger, PhD, Duke Translational Research Institute, Duke University Medical Center and Annemieke Aartsma-Rus, PhD, Leiden University Medical Center, and Executive Editor Graham C. Parker, PhD. Nucleic Acid Therapeutics is the official journal of the Oligonucleotide Therapeutics Society (https://www.oligotherapeutics.org/). Complete tables of content and a sample issue may be viewed on the Nucleic Acid Therapeutics website.